Despite increasing development, the village character is still very prevalent in Leh, the erstwhile capital of India's high-altitude Ladakh region. 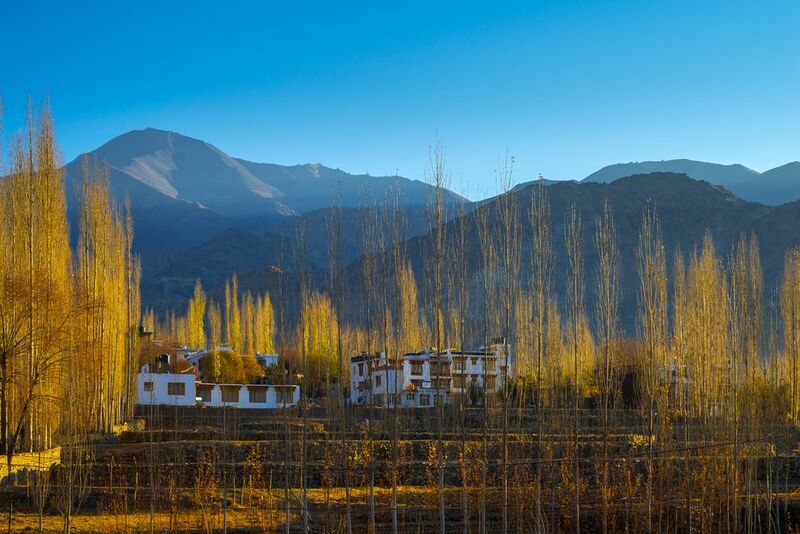 Most homestays in Leh are located surrounded by fields on the northwest outskirts of town, in the agricultural Changspa area. This area is popular with backpackers and other travelers, and is a 10-15 minute walk into town. The homestay hosts grow their own organic vegetables, which they use in preparing wholesome homemade meals for guests. They're also very helpful in giving input to itineraries and making travel arrangements. Leh's most luxurious and comfortable homestay, Adu's definitely lives up to its name! Everything is outstanding, from the delicious food to the hospitality. The property has been newly constructed in traditional style less than 10 minutes walk from the Main Bazaar, but it's modern and refined inside. There are nine guest rooms, many of which overlook the front garden and have their own porches. There's also a communal sitting area in the garden, perfect for relaxing. Decent (free) wireless Internet and 24-hour running hot water are important features. You'll never want to leave! Rates start from 2,250 rupees per night. Breakfast is additional. The hosts of this reliable homestay are locals who have been living in the area for many generations. They built an extension to their residence, about 15 minutes walk from town on Upper Tukcha Road, to give tourists an opportunity to experience Ladakhi culture. The numerous accommodations are spread across the older extension plus a contemporary new building, which was completed in 2015. The newer rooms are more spacious and airy. There's plenty of hot water and a small library. Guests are welcome to join the courteous Gangba family in their daily activities, including tending to their farmland and cooking. The hosts also offer fresh apples and apricots off their trees. Yum! Rates start from about 1,200 rupees per night. Tukchu Homestay sits at the base of iconic Shanti Stupa in Changspa, a little further out than most other homestays (it's 20 minutes walk into town). However, it's super popular, and has a memorable view across to Leh Palace and Namgyal Tsemo Monastery. An endless supply of fresh mint tea is served, and the kitchen is available for guest use as well. Guests are also welcome to pick and eat apples from the trees when in season. Other highlights include lots of interesting books and conversation with the knowledgeable hosts, who go out of their way to make guests feel settled. Expect to pay around 2,000 rupees per night for a double room. Note that the owners are also constructing another homestay (to be called Tukchu Heritage Home) near their native village, on the way to Pangong Lake. Jimmy's Homestay is run by Jigmet (Jimmy) and his affable parents, who reside on the property. Jimmy's mother is an excellent cook, and she serves breakfast and dinner. Guests can use the kitchen to make lunch, at an additional cost. There's also a cafe on the premises. The rooms are cozy, clean and safe, with 24-hour hot water and mountain or garden views. Discounted bike rental is possible. The only drawback is that it takes about 20 minutes to walk into town. The area is quiet though. Expect to pay 1,500 rupees per night. The whole family gets involved in running this big-hearted homestay, with the lady of the house taking special care of guests. Not only are guests served meals made with organic vegetables, fresh milk from the farm is provided as well. Meals are served alongside the traditional Ladakhi kitchen, so you'll really get a feel for the lifestyle there. The well-appointed guest rooms have been newly constructed around the garden and have big bathrooms with 24-hour running hot water (no buckets). Rates range from 1,900 rupees to 3,400 rupees per night, depending on how many meals are provided. Read reviews on Tripadvisor. Osel Boutique Homestay has a different location to the other properties mentioned in this article. It's situated in Skara, about five minutes drive southwest of the town center, off the Srinagar-Leh Highway. The homestay is ideal for those who would like an intimate and luxurious stay. There are just three elegant and spacious guest rooms, plus shared common room and balcony with views across the Stok Kangri mountain range. The hospitality and food are superb, and guests are invited to dine with the hosts. Cooking lessons are also offered. Expect to pay 4,000 rupees per night for a double room, including breakfast. Read reviews on Tripadvisor.